Over the winter, the Scottish Fisheries Museum has had the unique privilege of being the only Scottish location (and one of only two UK venues) to host the European tour of Dutch textile expert, Stella Ruhe’s, exquisitely recreated traditional fishermen’s sweaters or Visserstruien. We displayed 40 of the 150 recreated ganseys, and visitors were able to get a distinct impression of the diversity and complexity of the patterns and the skill required to produce these garments. 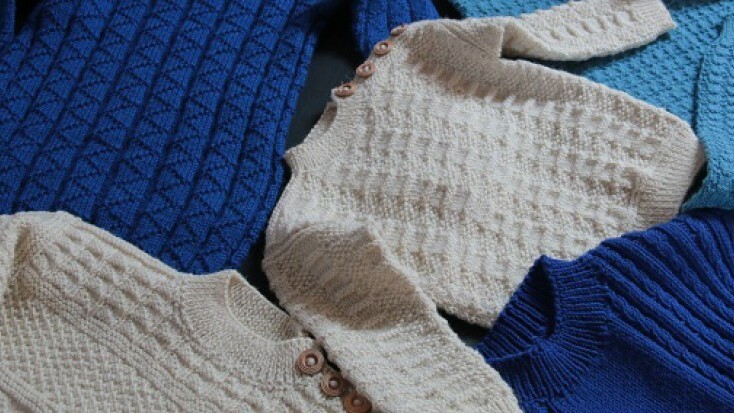 Stella travelled around the coastal villages of the Netherlands identifying multiple, distinct patterns incorporated into Dutch fishermen’s jumpers from photographs then recruited volunteers to help recreate 150 of them using modern yarn and the traditional knitting methods. The resulting exhibition, illustrated with archive photography showing Dutch fishermen wearing the original designs, makes for a compelling insight into this cultural folk phenomenon and female craft heritage which spans not only the entire coastline of the British Isles but also, as only relatively recently discovered, down the North Sea Coast of the Netherlands. The Scottish Fisheries Museum has its own collection of ganseys which, along with the rest of the costume and indeed entire collection, has been Recognised as a nationally significant collection by the Scottish Government. “Wonderful display of ganseys, such interesting information and so well laid out” ”Feel inspired! Wonderful”. The weekend of 24th/25th February provided a final opportunity to see this exhibition (before they were packed off on their further adventures across the Atlantic to Alaska) with the exciting addition of events featuring their maker, Stella Ruhe, all the way from Amsterdam as well as a lively knitting class with renowned couture knitwear designer whose work features on high fashion runways across Europe, in fact Di and her team had been knitting late into the previous night for a Paris Fashion Week collection so there was lots of coffee being ordered in the tearoom that morning! Visitors came from Dundee, Aberdeen, North Berwick, Dysart, Falkirk, Tayport and even Birmingham to see the exhibition and hear Stella’s talk. It was made possible to bring the exhibition and events weekend to Anstruther thanks to financial support from Fife Council’s Common Good Fund. Over the course of the weekend we also had the pleasure of meeting Andrea Liu, an American final year design student form Central St Martins College in London who is researching the fishing industry, community and crafts to inform her degree show in June. Andrea is producing leather made form salmon skin which she collects from waste at Billingsgate Market. Her work is surprisingly beautiful and possibly very important in a reduced plastic world and got us thinking about a potential collaborative exhibition for the future… Watch this space!